Good Point: Ethical Electronics, Recycling "e-Waste" Blog: SMOKING GUN: Multiple Reports on Agbogbloshie, Ghana, source pollution!! Yep. They cite the statistic BAN made infamous by claiming never to have said it. Now over the past year, I've developed a very frustrated relationship with Richard Fuller's organization. Dr. Caravanos has presented to the Society of Environmental Journalists (http://www.sej.org/) and has done more than anyone I can think of to carry the concerns about gold mining, and lead mines, like Kabwe in Zambia. The horrific pollution at these primary metal mines was the very reason I became an environmentalist and recycler in the late 1970s. Some of the time, I feel like Pure Earth and poor old Dr. Caravanos are victims of this hoax. 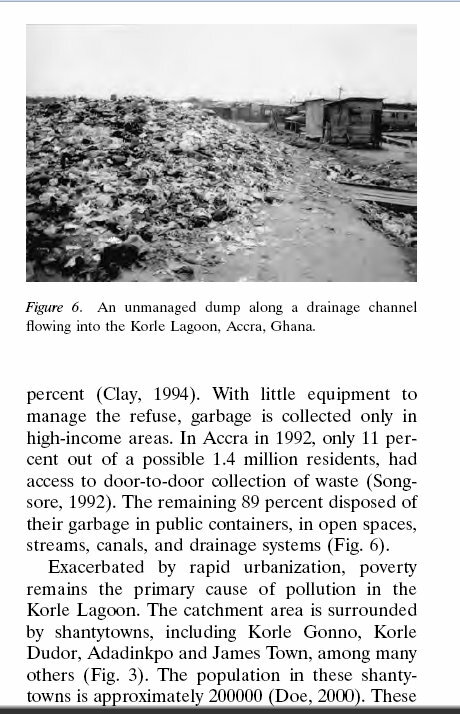 In "It has been estimated that 70-80% of e-waste is exported to countries in Asia and Africa" on page 17, they no doubt did nothing worse than Dr. Josh Lepawsky has discovered everyone did... the statistic was one of the most cited in all academic journals on e-Waste. But when the source of the statistic denies ever, ever having said it, and starts spinning like a top, you'd think they'd want to know about it and address it when that source in turn CITES BLACKSMITH in saying Agbogbloshie's e-waste dump is not a hoax. So Blacksmith and Greenpeace cite Jim, who in turn says he's never studied Agbogbloshie and cites them. If you were Joe Benson, or someone like him, under threat of prison for "common knowledge" of dumping, who would you contact? Well, they are contacting me, so what can I do? Sadly, Blacksmith/PureEarth refuses to accept our invitation to correct a single mainstream press report citing their "Top Ten" list as the source of the "data" about Agbogbloshie. Unfortunately, the last thing I heard from them was "Please don't contact us anymore", which was directed not only at me personally, but the invitation I had just given them to meet with Ghana representatives of WR3A (Emmanuel Eric Nyalte and Wahab Odoi). Will the project to "Transform Agbogbloshie" be successful? Another quote from the 2002 Kuitunen / Owusu Report describes what had to go "right" for the OPEC Grant to "Transform" Agbogbloshie. "Communities must be provided with both economic and social incentives that will enable them to contribute meaningfully to the project's success. Since pollution in the lagoon is related to lack of basic sanitation facilities, providing communities with such facilities will reduce the pollution and make the project sustainable." The studies of pollution of African urban landscapes, of river pollution, stormwater runoff, and sewage, are fairly easy to find. The Basel Action Network's "solution" of boycotting and imprisoning African Technicians, putting men like Benson in Western prisons, shows that people aren't even reading the previous studies... the "solution" is aimed at making Westerners feel responsible, and giving African leaders an excuse to blame Western dumping. The exaggeration and simplification of development-driven pollution is not confined to Agbogbloshie. Guiyu, China, is the home of a major textile dying industry. Telling reporters that "ewaste killed the river" isn't just irresponsible. It's basically defrauding Interpol of its scarce resources, defrauding funders who donate to "saving Africa" by shredding computers, and defraud collectors of computers who shred rather than sell them to people who want to buy them. African technician entrepreneurs are forced into back alleys, forced to buy from people who could care less about "ewaste atrocities", and everything gets worse. Lord Chris Smith (UK Environmental Agency) should have simply spent a day at the library rather than speaking with NGO leaders who made it up as they went along. Keep in mind I've met Joe Benson. I've met other Africans whose goods were seized. I saw an R2 Company in North Carolina call Malaysia DOE to report a certified contract manufacturer. I lived in Africa for 30 months between 1984-87, and was quite aware of the pollution occuring in Africa's rapidly emerging cities. We all wanted the cities to develop, and to balance the concerns of pollution and development has been a large part of my career. If you were me, you'd really have no choice but to write this blog and follow Jim down the river to unite with his family. So yeah, it's a little frustrating when millions of dollars are given to Accra in 2002 to dredge a lagoon, and it never happens, and millions again in 2012 (by IMF), and nothing happens, and then hundreds of thousands given through GAHP to buy a wire stripper that's worth a few thousand and which is completely inappropriate and by several accounts was never used. 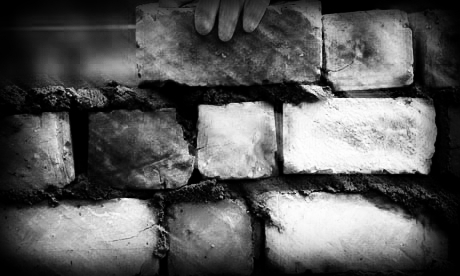 If PureEarth/Blacksmith is going to take the trouble to "double down" and announce in July 2015 that the grant is a success, and that Agbogbloshie is being "Transformed" - at the same time the homes are being knocked down and Interpol has announced Puckett and Anane to describe Agbogbloshie to Interpol agents ... 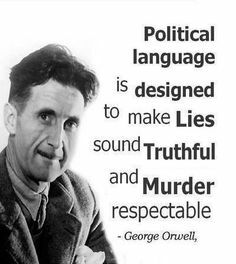 I'm sorry, this is Orwellian. 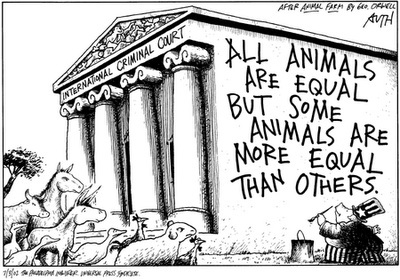 This is Animal Farm. The fact is that cities like Accra werehad less than a million residents in 1980 and now have up to 5 million (depending on where you draw a rapidly expanding city line). Most of the homes and businesses still dump their municipal solid waste, batteries, freon, diapers, etc. in the ditches and canals leading to the Odaw River, and virtually nothing has changed direction since all these reports were written. The only stuff that is getting recycled - what we want - is getting recycled by the linguistic minorities (like Dagbani) who lived in the slum of Old Fadama. Westerners are taking money to declare the West is dumping pollution in boats from the sea, and that stupidity is distracting Interpol wildlife agents from enforcing ivory and rhino and endangered species hunting laws. 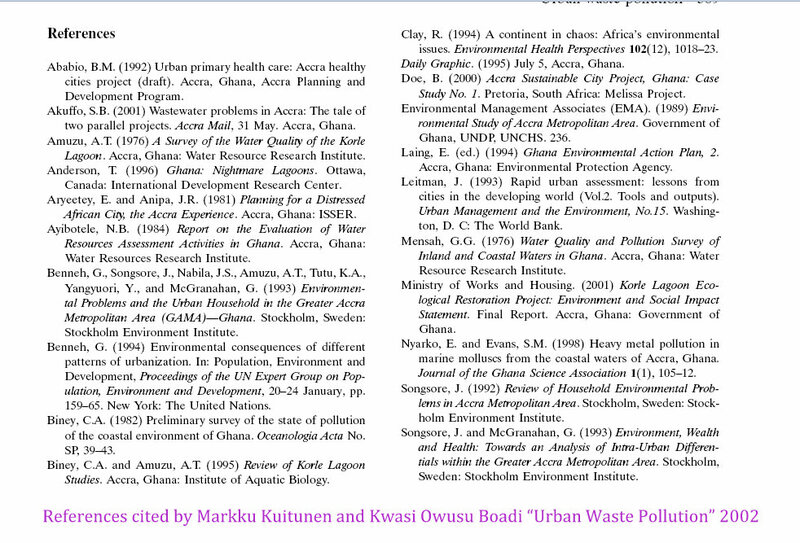 A couple of studies cited in the Urban Waste report below. Biney, C.A. 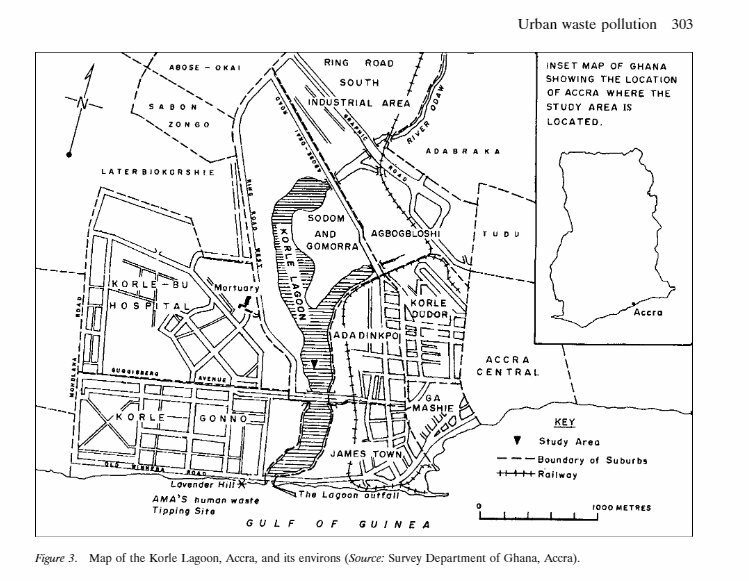 (1982) Preliminary survey of the state of pollution of the coastal environment of Ghana. Oceanologia Acta No. SP, 39–43. Mensah, G.G. (1976) Water Quality and Pollution Survey of Inland and Coastal Waters in Ghana. Accra, Ghana: Water Resource Research Institute.